SPY rose by 2.3% this week, to a new all-time high! My account rose 2.1%, to its highest value since April 5th. The loss-floor is now -7.0%, same as July 13th. US news: Bernanke has fired his last bullet! QE3 is now officially on. The financial beatings will continue indefinitely or until morale improves or until the US dollar is finally and completely destroyed. 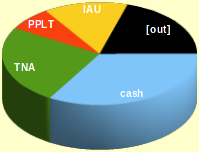 IAU, PPLT: Responded as expected to Thursday’s QE3 announcement. TNA: Had sold ⅔ on Friday, which settled on Wednesday. Bought back ⅓ on Tuesday, for a worse price (total of ⁴⁄₃ bought, ⅔ still owned, so 50% owned). Bought more on Thursday in response to QE3 announcement (now 2.3 tranches bought, 1.6 tranches still owned, so 69%). All this buying and selling used up the max-loss gains for the week, so the +0.2% figure did not change (but I now own a lot more stock with the same maximum loss as before). TNA: Doing well! If we get a downturn next week (as happened after QE2 was officially announced), the robot should get me out of this trade with a nice profit. VPSville.ca: New server is set up and fetching hourly quotes. For this week, buy & sell orders were disabled on the new server, still running on the old server. HostMDS.com: I plan to shut this down next week. The chart at right shows seconds of quote-fetch time in blue and yellow. There were seven fetches per day over five days. Also shown are the number of erroneous prices corrected by the once-daily recheck. The new server is much better!